The fresh scent of pine cones add to the Christmas feel during the holidays. 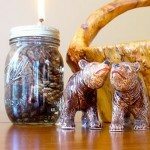 There are many ways to get that scent linger in your home, but the best way is to make mason jar candles using pine cones. Not only do they smell good, they make pretty decorations too! There are many scents to choose from. While pine is quite popular, other scents such as citrus, coffee, vanilla or a combination of one or two. Whatever your nose fancies – it’s really up to you! One of the good things about it is they keep well and long. For some homes, like in ours, it has become a tradition to bring them out during the holidays. We simply refill existing mason jars with a new oil and scent, put in a new wick and you have yourself a mason jar candle for the holidays! Is this going to be your next craft project? Next articleMake a snowman out of a christmas tree! Do you have the step by step instructions for this, the link provided doesn’t work. I never found the instructions on how to make the mason jar candles. Went to 4 sites and still nothing. Here are Illustrated Instructions Step-by-Step. Hi Katina. We have fixed the link. Sorry for the inconvenience. Hi Jeannette. We have fixed the link. Sorry for the inconvenience. Hi Donna, We have fixed the link. Sorry for the inconvenience. Hi Elizabeth, We have fixed the link. Sorry for the inconvenience. Can I use another type of Oil? You have taken other peoples photograph using them here without permission. I would like to ask you nicely first to remove them all or link to the proper creators. Hi I was really interested in making the mason jar candles but the one on the step by step instructions only has floating wicks with no lids instead of the cotton wicks shown on the original site. Is there step by step instructions for the candles with the lids? The link does not have the lid with the wick, just a floating candle wick. How do you get your mason jars with the wick and lid attached? Also, in the instructions by Garden Matter, she reports having problems getting the wick to burn. Do you have that issue and how did you go about making sure the wick does not slide down? Thank you. The link works fine, now, thank you. I do have another question though. Patti (at gardenmatter) ended up using floating wicks on top of the oil as the long wicks going through the lid wouldn’t stay lit. Said she even soaked the wicks in oil before putting them in the jars. I’ve had this issue before with oil candles/lights that I’ve tried yet this is the first time I’ve heard anybody else mention it. Do you have a problem with the lights going out? This is a beautiful idea. Thank you for sharing. The link doesn’t show up? If you go to the step-by-step instructions you will see that the ones she made with the lid on didn’t work. Instead, she used floating wicks. So your list of materials is wrong based on the tutorial. Hello! Some of the photos show the lid on, and some off. Are the instructions the same for both types of candle?